The midnight launch of the Goods and Services Tax regime was a selfie moment for many MPs who wanted to capture the historic moment. The midnight launch of the Goods and Services Tax regime was a selfie moment for many members of parliament who wanted to capture the historic moment. 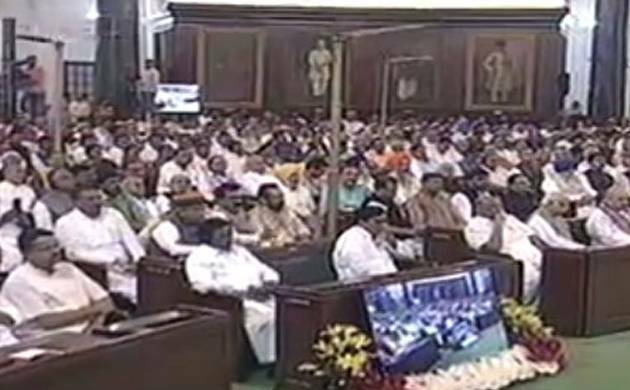 Hema Malini and many other MPs were seen taking photos from their mobile phones in the Central Hall of Parliament, where the GST launch ceremony was organised. Even Minister of State for Civil Aviation Jayant Sinha was seen taking pictures when Prime Minister Narendra Modi was giving his speech. Some of them were seen taking videos as well from their mobile phones. The Central Hall was fully packed and many MPs had to squeeze together on fellow members’ seats. Some senior MPs were also seen dozing off during the midnight event.